In 1543 Henry VIII arranged a marriage between the infant Mary Queen of Scots and his six year son Edward, the Prince of Wales. He was enraged when the Scots repudiated the betrothal. The resultant series of punitive expeditions intended to restore the hand of Mary to the young English Prince were known as the 'rough wooing'. On Henry VIII's death in January 1547 his son became Edward VI. As the new King was still only nine years old the 'rough wooing' was resumed on his behalf by the new Protector of the Realm, the Duke of Somerset. On 1 September 1547 Somerset crossed the border into Scotland with 80 cannons, 8,000 foot and 4,000 cavalry (including a contingent of Spanish horse). He was supported off the coast by the English fleet, commanded by Lord Clinton. In response to the English threat, the Earl of Arran, Mary's Regent, summoned every Scottish man between the ages of sixteen and sixty to assemble at Edinburgh with one month's food. Though woefully short of artillery and cavalry, the resultant army of about 25,000 men was deployed on high ground behind the River Esk. To their right was a marsh and to their left the sea. On the seaward side they had also erected an earth bank to protect themselves from the cannons of English ships. The Duke of Somerset arrived to find himself outnumbered almost 2: 1. Reluctant to mount a frontal assault on the formidable Scottish defences, he stalled for time. On 9 September the Earl of Arran rashly advanced his 1,500 cavalry in order to lure the English to attack. Tragically for the Scots, this bait worked only too well. In a relatively short space of time the English horse, under Lord Grey, effectively destroyed the Scottish cavalry as a fighting force. On the morning of 10 September 1547 the English army began a slow advance, dragging their heavy cannons over the rough ground towards the river. 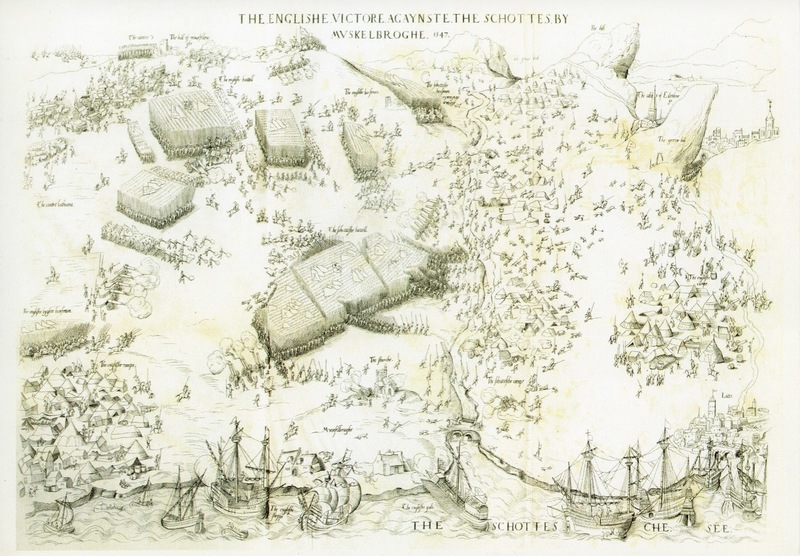 The Scots responded by abandoning their impregnable position in order to launch an attack of their own. Somerset could hardly believe his luck. On open ground his strength in artillery and cavalry could be deployed to the best advantage. Three Scottish pike divisions led by the Earls of Arran, Huntly and Angus crossed the river and crowded in upon each other until they formed one vast pike block. It was an imposing sight, but the flanks of this formation were very vulnerable. The Earl of Argyll's Highland division, which should have comprised the left wing, had been driven off by the guns of Clinton's fleet offshore. On the other side the battered remnants of the Scottish cavalry formed a thin right wing. As the English horse charged towards them, the Scots adopted the defensive schiltron formation in which the mass of pike points bristled like' ... the skin of an angry hedgehog'. Grey's cavalry floundered into a ditch, struggled free and came gamely on to hurl themselves against the Scottish pikes. Not surprisingly the schiltron proved impervious. Providing the Scots kept close together, their pikemen were more than able to hold the English cavalry at bay. In the pandemonium that followed, men and horses were disembowelled and Grey himself was struck through the mouth by a pike point. Then, at last, the English cannon began to pound, wreaking bloody havoc among the dense mass of the Scottish formations. Packed together like sardines, whole lanes of pikemen were gored and dismembered by flying round shot. While the Scots were still reeling beneath this onslaught, Pedro de Gamboa's contingent of Spanish cavalry sallied forth to demonstrate state-of-the-art European tactics; firing their arquebuses from the saddle. English arquebusers and archers rushed forward on foot to add a few volleys of their own. Finally, as sheets of rain began to sweep in from the sea, the persistent English cavalry rallied for another charge. The Scots attempted an orderly withdrawal. However, with visibility reduced by smoke and rain, and shouted commands drowned out by the din of battle, panic swept the ranks and the army disintegrated and fled, with the English horse in triumphant pursuit. 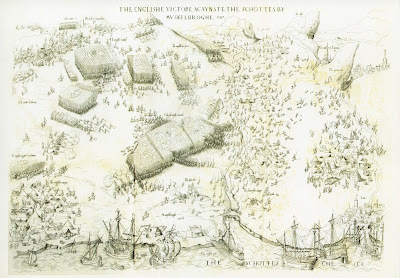 Surprisingly, for all the blood spilled in the 'rough wooing', Somerset failed to consolidate his victory by taking possession of Mary Queen of Scots. The planned matrimonial union of England and Scotland never took place. It was not Mary, but her son James Stuart, who was one day destined to wear the English crown.